1. Preheat the oven to 200°C, gas mark 6. 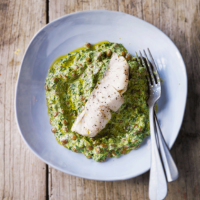 Place the hake on a small baking tray, cover loosely with baking parchment and bake for 25 minutes. for a minute, then add the lentils and heat through for 1-2 minutes. 3. Remove from the heat, stir in the yogurt and season to taste. Serve topped with the hake fillets.